Star Wars Plush - Stuffed Talking 9 inch Chewbacca Character Plush Toy - Thistalking re-creation of absolutely everyone's favorite Wookie makes hisinfamous growl when his tummy is pressed. Chewbacca's ultra luxe fur is almostas soft as silk. He is the perfect companion for anyone who has ever wanted afurry co-pilot of their own. Exciting gift or addition to your Star Warscollection. Spoken phrase is the trademark Wookie Growl. 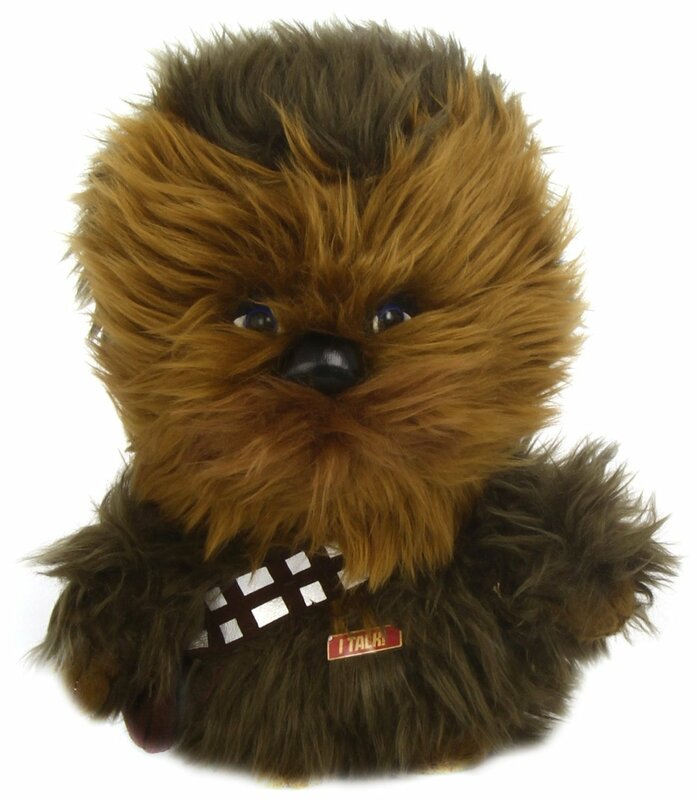 This Chewbacca isperfect for any fan who's ever wanted a furry co-pilot of their own. Yoda,Darth Vader, Jawa and R2-D2 9 and 15" talking plush also available. Collectthem all. Recommended for ages 3+. Requires 3 AG13/LR44 button cell batteries.Batteries included, not rechargeable. From the Manufacturer This 9" talking re-creation of absolutely everyone's favorite Wookie makes hisinfamous growl when his tummy is pressed. Chewbacca's ultra luxe fur is almostas soft as silk. He is the perfect companion for anyone who has ever wanted afurry co-pilot of their own. Exciting gift or addition to your Star Warscollection. Spoken phrase is the trademark Wookie Growl. This Chewbacca isperfect for any fan who's ever wanted a furry co-pilot of their own. Yoda,Darth Vader, Jawa and R2-D2 9 and 15" talking plush also available. Collectthem all. Recommended for ages 3+.